BBQ Chicken Wings Unlike Anyother. 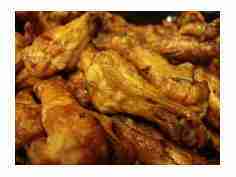 This BBQ chicken wings recipe is the real deal. My guess is that most of you don't have the type of BBQ set up I use in this video , but no worries. You can use a weber grill with hickory chips and indirect heat to accomplish something really close. The key is to remember that these are not "Buffalo Wings." These wings have a smoky flavor and are dipped in spicy BBQ sauce. It is a totally different taste than buffalo style wings. Don't get me wrong, I love buffalo wings. But, I also love these wings just as much. These isn't a lot to explain here. All I do is cut the wings up properly and apply Cajun rub on one side and Fuzzy's Pork Rub on the other side. I like the combo of spicy heat with sweetness of the pork rub. Once the wings are done I place them in a crock pot. I do not put the sauces on the ribs. Lots of people love just the smokiness with the spices. I place a bowl of Fuzzy's hot BBQ sauce and Fuzzy's mild BBQ sauce on the side. I also place a bowl of blue cheese and a bowl of ranch dressing on the side. I do a little newsletter called "The BBQ Gazette." In this monthly newsletter I share new BBQ and grilling techniques, recipes, my opinions on various brands of grills, utensils, rubs and sauces. I also discuss how to compliment your dish with the perfect beer or wine. Just fill in the blanks below, and please don't worry. Your email address is totally safe with me. Within 24 Hours, Probably Sooner! Leave BBQ Chicken Wings and Return to BBQMyWay Homepage.